Agar-agar is a natural vegetable gelatin derived from red algae. Agar agar is suitable for vegans, vegetarians and for most religious diets. Agar is, melting at around 85 °C and solidifying to around 37 °C. It is sold in package of dried strips, flakes or in powdered form. For making jelly, it is boiled in water until the solids dissolve and then flavor or color is added. The liquid is poured into molds to set and can be served as desserts or vegetable aspics. Agar agar is unflavored, is rich in iod and has a mildly laxative properties as is consists of approximately 80% fiber. Agar-agar sets in about an hour and don’t worry if you don't get it right the first time, you can fix it by reheating the gel. I use 10 g of powdered agar agar for 1 l of neutral liquid and 13 g of agar agar for liquids with acidic ingredients. Keep in mind that high acid fruits like lemons or oranges may require more agar-agar. Also, enzymes from fresh mangoes, papaya, and pineapple break down the gelling ability of the agar-agar so that it will not set. You need to cook these fruits before adding them to a recipe to neutralize the enzymes so that the agar-agar can set. Do not shake or disturb the jelly before it have set completely, otherwise it will not set. The form you use to set the jelly must be grease free. Playing with agar agar is a lot of fun, here I will show some of the stuff I have done with it. 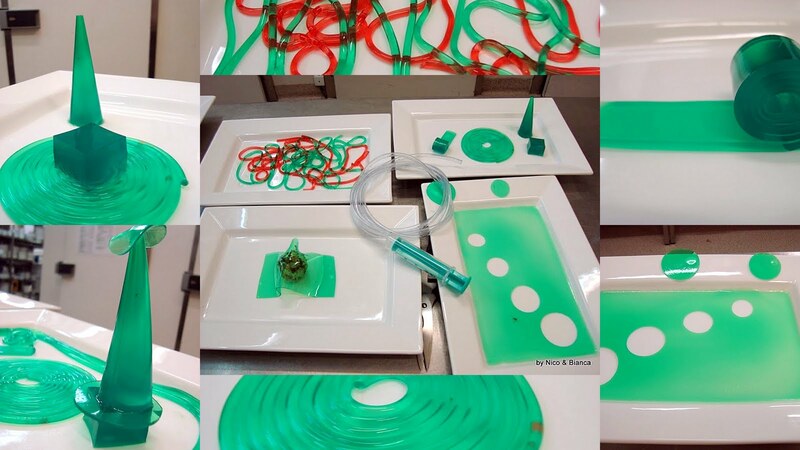 I use agar most for desserts but, from decorating the plates to making jellies, desserts or just a garnish to a dish. 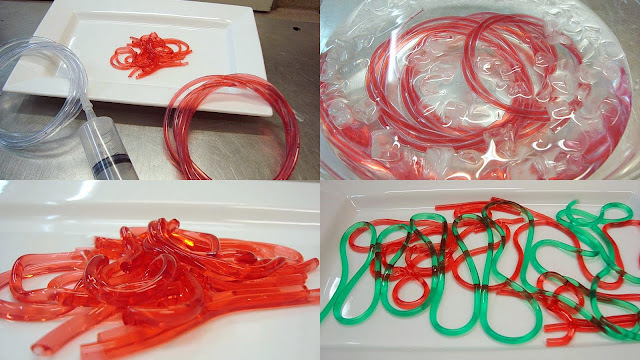 Here I made peppermint agar in different shapes for different desserts, from cubes to spaghetti. Here I made strawberry spaghetti were you need to use a syringe and a bowl of ice. I dissolved the agar in strawberry syrup and water. Use the syringe to insert the syrup mixture in the tube and chill in the ice water for 3 minutes. Use the syringe to push out the spaghetti. Blueberry caviar made by dripping blueberry and agar mixture in a ice cold water. Here I made white chocolate jelly and served with salmon caviar and blueberry caviar. To be honest, I did not like this combination of flavors. Coconut jelly and blueberry jelly with fruits. Here I use agar to the sauce of a clasic dish for a new presentation. Here I made chocolate jelly and served with mango sorbet on a top of a chocolate sponge cake. Chocolate jelly served with chestnuts compote. Vodka jelly cubes. These are great for parties. Vodka jelly cake. Recipe here. Mango jelly with popping candy and marinated grapes on champagne and mint. Here i made different fruits jelly in silicon forms. Mango jelly with raspberry soup. Trio jelly with Baileys shot. Jelly on the glass with chocolate truffles. Green mussels with trio beetroot. Spicy sprat with beetroot jelly. Salmon tartar with beetroot jelly and polenta. White chocolate truffle with peppermint jelly. Buna Nico, spune-mi te rog la ce pret achizitionezi tu agar-agar-ul ? Eu caut in Romania, am gasit ceva, dar in cantitati mici. si nu stiu de ce ma mai mir??? Wow you really couldn't stop making things with it! Looks amazing! Hi. We are two students from New Zealand. Our Science Fair project is aout making jelly with popping candy. We were excited to see that you have already done it. Do you have any advice for us? Could we contact you by email?